Where We Stand – The Best of 2011 So Far. I really couldn’t help myself. As the movie season shifts focus from typical summer-fare to Oscar-hopefuls, my excitement has reached borderline hysteria. With the Venice Film Festival and Telluride Film Festival in the books, and with the Toronto International Film Festival underway, I decided to reflect on the best films of 2011 so far. If anything, I hope to highlight films that will be lost (or perhaps rediscovered) once we’re in the thick of the awards season. 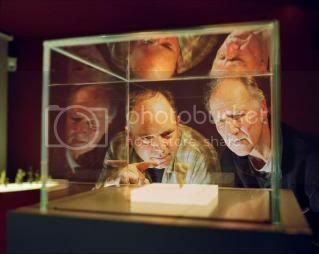 An example of guerrilla filmmaking, seasoned German director Werner Herzog muses over the images found in the Chauvet-Pont-d’Arc cave. His film sports the most impressive use of 3D that I’ve seen thus far, wherein the images of the cave are brought to the forefront. With Herzog’s unconventional narration and wry humor, Cave of Forgotten Dreams stands as one of the many fantastic documentaries to be released this year. Awards Prospects: Minimal. Despite being lauded by the critics, the film has been lost in the conversation. Not even within the documentary branch does the film seem to be garnering much attention. It has had a relatively impressive box office run though, so it’s not entirely out of the race for Best Documentary. But with fellow German director, Wim Wenders garnering buzz for his 3D dance documentary, Pina, it may simply be too late in the game to make a play. A wonderfully atmospheric adaptation of Charlotte Brontë’s novel, Cary Fukanaga’s Jane Eyre resonates as the sort of film anchored by a strong sense of directorial prowess and strong performances. Starring fresh faces in Michael Fassbender and Mia Washikowska, Jane Eyre is elevated outside of overwrought melodrama and into a film of attuned emotional longing. Awards Prospects: Minimal. The Adapted Screenplay field is a bit too crowded this year for Jane Eyre to make a play. While Michael Fassbender’s stock is quickly rising, his performances in Shame and A Dangerous Method will be fresher in the Academy’s mind. 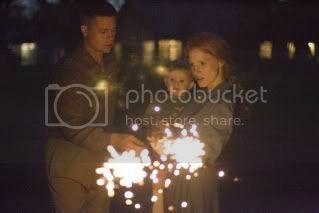 And given the subtlety of his work in Jane Eyre, it’s doubtful that he’ll get any recognition for the role. 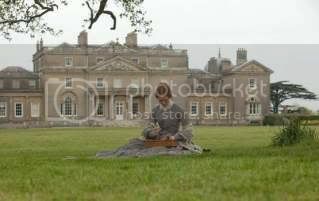 The quietness of the whole picture will pose problems for Mia Washikowska too. Its best play will be in Costume Design, but even that’s doubtful. What Mills achieves with Beginners is bringing forth a sense of cosmic unity between past and present, wherein the actions of our parents affect the way we view relationships. I was a bit resistant to the idea, perhaps as a result of watching The Tree of Life prior (which deals with similar content). But as I reflect on the film, I gather that Mills really did want to contain the film to the specific people that we saw, and brought forth this sense of cosmic unity as a way to bridge a gap between this biographical sketch of his life and the audience. Awards Prospects: Moderate. Christopher Plummer is a frontrunner for Best Supporting-Actor and deservingly so. His role as an aging father relishing in his sexual reawakening had a mark of poignancy that certainly deserves recognition. I could potentially see Beginners getting some notice in the writing branch, particularly if Focus Features doesn’t intend to put all its eggs in one basket with Tinker, Tailor, Soldier, Spy. Unfortunately, strong lead performances from both Ewan McGregor and Melanie Laurent will go unrewarded. It still befuddles me to think of how much I enjoyed this piece of summer fluff. 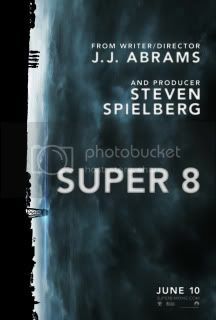 While acknowledging Super 8 as such may seem a tad dismissive, it really shouldn’t be read as derogatory – J.J. Abrams successfully blended what has become typical summer-fare with impeccable direction and a tendency to actually focus on characters over CGI-carnage. That focus on character makes all the difference, as Super 8 feels less like something of the now and more like something of the then – a yearning for a bygone era when summer films had a heart. Awards Prospects: Moderate. Well, it will likely get nominated in the sound categories. I’m convinced that Michael Giacchino will be in play for Original Score as well, particularly given that John Williams will be splitting votes for his work in War Horse and The Adventures of Tin Tin. But amongst the major awards, it really doesn’t seem like the film will get a whole lot of play. There’s not a whole lot of buzz for it at the moment, as it seems to have fallen out of favor amongst the summer films as Harry Potter and Rise of the Planet of the Apes stole some of its thunder. In a mish-mash of genres, Rango provided one of the most genuinely bizarre and engrossing blends of genre as of late. 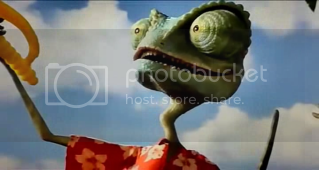 Here we see a chameleon named Rango (voiced by Johnny Depp) trek through a path of self-discovery. Forced to forge a new identity in a small town, the chameleon takes the role of sheriff and hero, despite his neurotic tendencies. Rango’s strengths rest in its appreciation for Western iconography and films like Chinatown and McCabe & Mrs. Miller – a combination that lends itself to a wholly unique experience. Composed of archival footage, Senna tells the story of Formula-1 race car driver Ayrton Senna. Knowledge of his career and significance aren’t prerequisites to appreciating the film – in fact, you might be better off not knowing anything about him. This largely stems from the approach Asif Kapadia takes in constructing his film – he details Senna’s life from his inception as a driver to his eventual death. But there’s an intimacy to it all. 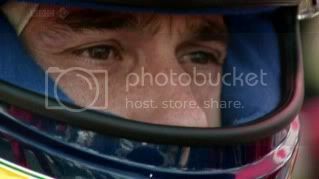 As you leave the track, you see footage of Aryton as he muses over his life – the film has a voyeuristic quality to it that can be incredibly engrossing. Awards Prospects: Minimal. The film might not even be eligible for awards contention given its reliance on archival footage. So right there it enters a field of problems. I highly doubt the film will get a nod as a result. It also deviates from traditional notions of documentary filmmaking, despite being a very linear and emotionally driven construct. In a perfect world, Senna would get some recognition for editing, as thousands of hours of footage had to be shaped into constructing this beautiful film. It won’t happen. 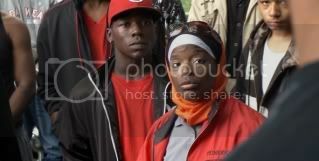 The Interrupters is a film that touches closes to home; or rather a film that serves to deconstruct my home. Living on the northside of Chicago, the problems of the southside are often topics of discussion when detailing the perverse and dangerous. What Steve James has successfully done in this documentary is place the audience in the reality of the southside, James burrows deep into the psyche of those in the midst of the violence while maintaining whatever semblance of humanity one can have in such a situation. Awards Prospects: Minimal. Its only category will be Best Documentary, and it’s an uphill climb for a film of this type. But there aren’t really any guarantees just yet in the field, outside perhaps Errol Morris’ Tabloid (which just missed my ten). The subject matter unfortunately feels too specific to a landscape – it might isolate other viewers from really appreciating the magnitude of what James achieves. And given that Hoop Dreams didn’t even get a nomination back in 1994, James’ prospects don’t look all too good. In Soderbergh’s best film since Solaris (2002), he immerses the audience in absolute fear. We start with Day2 and the sound of a cough. With the utmost precision and intellect, Soderbergh proceeds in spectacular fashion as the world is engulfed in disease and misinformation. Beyond simple genre definitions of horror or thriller, Contagion exceeds as an exercise in meticulousness filmmaking from director at his very best. Awards Prospects: Minimal. While critically admired, Contagion certainly hasn’t gotten uniform raves. The performances in the film are a bit too subtle to really register with voters. Soderbergh’s direction and visual sense aren’t showy enough to garner attention. If the film manages to have legs, then perhaps it can remain in the conversation. After all, that’s all it took for The Town to maintain its buzz. But then again, when it came down to it The Town didn’t make it to the end of the race. Elegant and ethereal, Malick manages to redirect and negotiate the very language of film. Very much a stream of consciousness, The Tree of Life operates under the idea of fragmented memories. But before all that, we see the grander scope of the film, where we see sequences of creation, dinosaurs, life, and death. The sheer scope and magnitude of The Tree of Life makes for an experience unlike anything you’ve seen before. Awards Prospects: Moderate. Emmanuel Lubezki’s cinematography is a lock for a nomination and is our likely winner. From there it gets tricky. The new Academy voting rules makes me believe that the film will indeed get nominated for Best Picture – there are likely enough voters out there to secure 5% of top votes. But that leaves to question – what about Terrence Malick? It’s hard to figure that the film will be rewarded but not the craftsman behind it. And given that many consider him to be the premier auteur working today (and still un-awarded by the Academy); I’m thinking he just might be able to get into the select five directors as well. The recent word is that Fox Searchlight is going to be pushing Brad Pitt for Supporting Actor. It’s a wise choice, and honestly, of all the actors to potentially double-dip, I can see Pitt getting nominations for Lead Actor in Moneyball and Supporting Actor in The Tree of Life. While it seems like the film may be a major player, it all depends on a lot of ifs. More so than any other film on this list, The Tree of Life is the sort of polarizing film that makes prognosticating its awards prospects difficult. While The Tree of Life may be more ambitious in scope, and Contagion more viscerally palpable, there’s just something to be said about the absolute wonder that Woody Allen’s Midnight in Paris achieves. There’s truly a magic to the film – wherein the audience is not so much transported through time and space, but transported by emotions and yearning. There’s such a nostalgic resonance to so much of Midnight in Paris, that it’s hard not to appreciate the film on its most basic level – as a film of pure and simple pleasures. Awards Prospects: High. With A Dangerous Method and The Skin I Live In drawing only reserved praise, Sony Pictures Classic has already campaigned heavily in favor for Midnight in Paris. It does help that the film has been consistently making a million dollars for well over 15 weeks – it has become the highest grossing Woody Allen film to date. At this point, I’d wager the film is a lock for Best Picture. Best Director is still in the cards, but given that Allen has not been nominated in the category for well over a decade, it may be time to once again embrace one of Hollywood’s most esteemed directors. Original Screenplay is a lock for a nomination as well, and depending on how well The Artist is received by both the public and critics, I sense that Midnight in Paris will take the category as well. From there it really depends on how much of the film the Academy is willing to embrace – lead actor for Owen Wilson seems a bit too farfetched at this, particularly given that we have not seen a lot of heavily rumored performances yet (Leonardo DiCaprio in J. Edgar for example). Its genre type will be Midnight in Paris’ biggest obstacle – it certainly has the tools to become a nominated film, but to take it all the way to victory is another story. Super 8 allows me to acknowledge a certain quality that I tend to gravitate toward in films – it’s the concept of nostalgia. I tend to melt and give myself to a film that takes a bygone era and playfully acknowledges it with a hint of humor. Super 8 does this on a multitude of occasions. Taking place in 1979, we see Walkmens, we hear My Sharona, and we don’t see a cell phone in sight. But the things that do remain are what make the film even more interesting – romantic longing, the joy of friendship, a sort of innocence of having your summer off. Of course, nostalgia can only take you so far, and it’s a good thing that Abrams seems to know what he’s doing; both with his script and direction. To say this film is tight might come across as dismissive, but that pretty much sums up what I thought of at least ¾ of Super 8. The opening sequence is virtually perfect – we are taken to a factory setting where we see a sign that indicates the number of days since there has been an accident. A man enters the frame as he removes the numbers – which are in the hundreds – back to one. 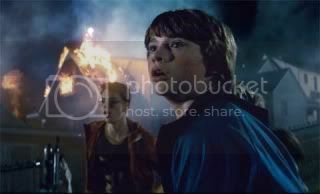 We then cut to a funeral party, as we see a young boy named Joe (Joel Courtney) alone on his swing, holding onto a necklace. The elements of this scene are important, in that so much of it comes back throughout the picture. And wrapped up in all of this is a level of earnest beauty, perpetual loss, and overwhelming tension. As the picture begins to develop, we see characters placed in a context of reality. Their behavior rings and exchanges constantly ring true. Them being grounded in a reality only escalates the tension in of their un-reality. It’s a monster film in every way, but given that Abrams takes time to develop his characters before introducing the source of chaos is enough to really elevate the material into something special. 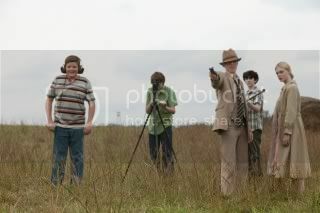 Super 8 falters as it reaches its conclusion. It’s expected, particularly given that the film is constructed around the idea of a monster plaguing a town, and eventually you’re going to have to have some sort of confrontation between your protagonists and antagonists. Abrams realizes a world-ending climax well, though it’s all disappointingly typical of a film that was anything but. Still, I can’t help but feel delighted by seeing a mainstream summer film that emphasizes character over action – what a novel idea.